TMJ, which is short for temporomandibular joint and muscle disorders—we’ll simply refer to it as TMJ from here on out, is a condition that can cause pain and or improper function of the muscles, which control the jawbone. For most people this isn’t a serious problem, although it can be more serious for some, while merely an annoyance for others. Often pain from TMJ is temporary, although it can continually occur in cycles. Several different things could cause TMJ disorders. Firstly, TMJ is caused by trauma to the jaw. But often TMJ just appears even if no trauma has occurred. It’s possible that oral disorders such as an overbite or other alignment issues can cause TMJ. Even orthodontic braces can cause TMJ to occur. 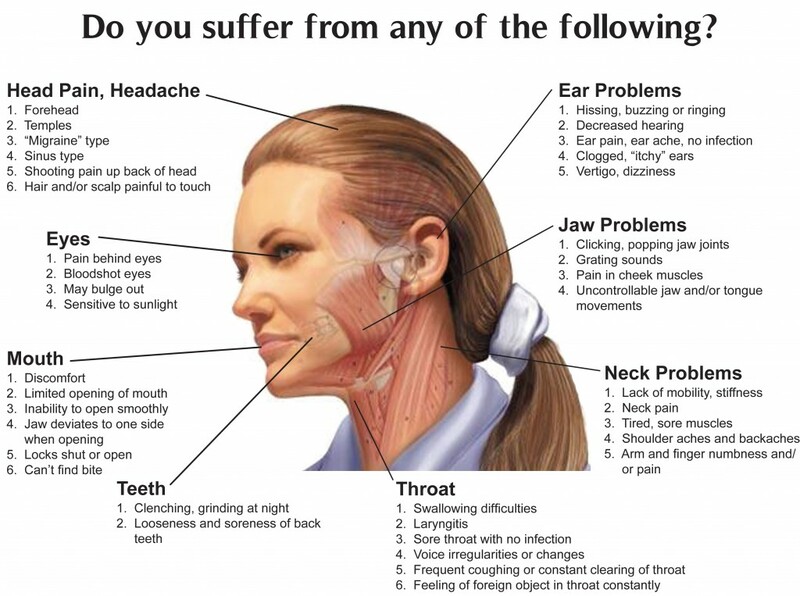 There are several symptoms that a person has TMJ: a radiating pain in the jaw or in the neck or the face, or, more obviously, in the jaw; if the jaw muscles feel overly tight; if the jaw is locked, or a person’s ability to move the jaw is limited—this could also be a symptom of a worse condition and treatment should be sought immediately; there’s a pain at the jaw when a person opens or closes their mouths and with the pain is a clicking feeling or sound; if a person’s teeth suddenly change, and the rows of teeth fit differently. These symptoms could all be signs of other oral issues, so it’s important to not jump to conclusions if you’re suffering from one or more of these symptoms. But, how will you know? It’s important if you’re suffering from any of these symptoms to consult your periodontist. Treatments for TMJ vary with severity. For some, simple jaw-stretching exercises could relieve the pain, while others may require pain medications to subside the insistent cycles of pain. Anti-inflammatories and muscle relaxants can be used for worse case scenarios. If you believe that you have TMJ disorder, it’s important to not immediately panic—remember the discomfort in your face or jaw could be from anything besides TMJ like, for instance, a sinus infection which is easily treatable. If you are suffering from TMJ please visit Periodontal Specialists of Montana today! Repair, for example, is not regeneration. Regeneration is return to normal architecture and functional health; repair is not. True Regeneration™ can be obtained despite the presence of periodontal disease – one of the most stubborn, persistent, and widespread infectious diseases according to the Surgeon General and the CDC 2010 NHANES report in the Journal of Dental Research on the prevalence of periodontal disease. (J Dent Res 89(11):1208-1213, 2010). ABOUT MILLENNIUM DENTAL TECHNOLOGIES INC.: Headquartered in Cerritos, Calif., Millennium Dental Technologies, Inc., is the developer of the LANAP® protocol for the regeneration of periodontal tissues destroyed by gum disease, and the manufacturer of the PerioLase® MVP-7™, the world’s first pulsed Nd:YAG digital dental laser. By providing a patient and doctor friendly experience with virtually no pain, bleeding, or post-procedure infection, MDT’s FDA-cleared and patented LANAP® / LAR™ protocol removes the fear from gum disease treatment, offering a vastly less painful and less invasive, full-mouth regenerative treatment alternative to conventional scalpel/suture flap surgery. The PerioLase® MVP-7™ is a 6-watt, free-running, variable-pulsed Nd:YAG dental laser featuring digital technology and 7 pulse durations in the 1064 nanometer wavelength, giving it the power and versatility to perform a wide range of soft- and hard-tissue laser procedures. The PerioLase® MVP-7™ is also developed for the LAPIP™ protocol, for the treatment of ailing and failing implants. Established in 1994, the company’s founding clinician, Robert H. Gregg II DDS, and wife Dawn M. Gregg DDS, continue to operate the company with the founding vision: “The Patient Comes First.” For more information, visit www.lanap.com. According to the Centers for Disease Control and Prevention, 2.3 million Americans smoke tobacco from pipes, and many of those who smoke waterpipes, or hookahs, believe it’s less harmful than cigarettes. 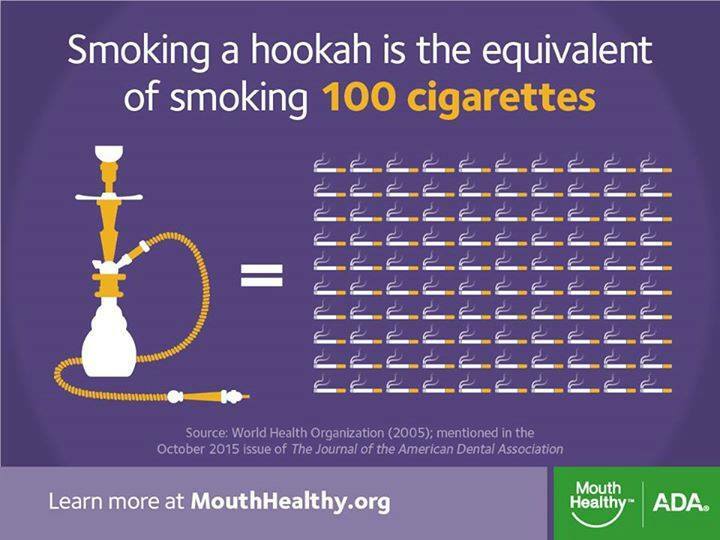 However, research published in The Journal of the American Dental Association (JADA) suggests hookah smoking is associated with serious oral conditions including gum diseases and cancer. The authors conducted a literature review that focused on waterpipe smoking and head and neck conditions. They found waterpipe smoking to be associated with gum diseases, dry socket, oral cancer and esophageal cancer among other conditions. According to the World Health Organization, smoking a hookah is the equivalent of smoking 100 cigarettes, based on the duration and number of puffs in a smoking session. The American Cancer Society is hosting The Great American Smokeout on November 19, 2015, an annual event that encourages smokers of all kinds to give up the habit. The event asks smokers to quit even for just one day to take a step toward a healthier life. Millions of Americans still use traditional methods of smoking, but emerging trends in the smoking industry, such as hookah smoking and e-cigarettes pose dangers as well. E-cigarettes are devices that turn liquid into a vapor containing nicotine. In an editorial in the September 2015 issue of JADA, authors warned readers of the potential dangers of e-cigarettes, indicating that oral health effects of their use has been inadequately investigated. “Additional research is needed on the impact smoking has on overall health, but it’s clear that smoking of all kinds has the potential to be dangerous,” said Dr. Glick. Dentists have an important role in advising patients of the dangers of smoking. The American Dental Association has long been a proponent of educating the public about its hazards and has urged for continued research into the adverse health effects of tobacco use. For more information on smoking and its oral health effects, visit MouthHealthy.org. There are thousands of different types of bacteria that live within our mouths. Our tongues, gums, and teeth are loaded with them. Most bacteria within our bodies are very helpful, but some bacteria can cause our bodies problems. For instance, some types of bacteria that live in our mouths can cause tooth decay. Tooth decay happens when the bacteria in our mouths use the sugars in the foods that we eat, producing in an acid that can cause a cavity within a tooth. The bacteria can use sugars and also starches to produce acid. While it is widely regarded that foods such as candy and sugary drinks such as soda, juice and milk cause cavities, foods such as breads and pastas, which contain starches, also help the bacteria to produce acids. A cavity develops through the constant exposure to acid. These prolonged exposures break down the enamel, removing its minerals; a small white spot on the tooth is evidence that this has occurred. Following an acid attack the enamel can harden again, by using minerals from saliva and fluoride. However if the acid attacks are too frequent or prolonged, decay can result. 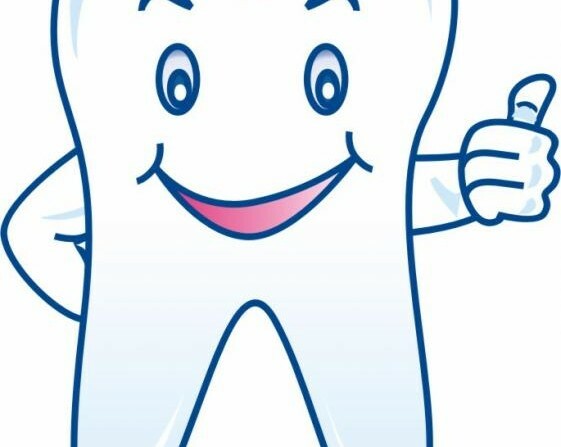 Fluoride is very important to preventing tooth decay, because it can stop decay from progressing, but, also, fluoride can reverse or stop an early decay of the tooth. Fluoride is in our toothpastes and even in most community water supplies. Most bottled waters do not contain enough fluoride to prevent tooth decay, so if a person only drinks bottled water, fluoride should be supplemented in other ways. Diet is very important to the prevention of tooth decay. Eat and drink sugary foods and drinks on special occasions. Try not to snack all day long; enamel needs some time to repair itself between meals. Do not eat or drink anything that contains sugar, after you have brushed your teeth for the night. Bacteria will have ample time to convert those sugars to acids while you sleep. Also, make sure to brush your teeth at least twice a day, and brush with fluoride toothpaste. 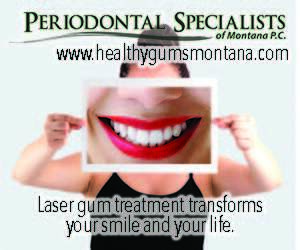 For more information on tooth decay and other dental related issues, please contact Healthy Gums Montana. The first decision you must make is what dentist you are going to see. While individual practitioners have their specific approach to treatment, the fundamental issue for you is the choice between the Procedure Focused practices versus a Problem Focused office. Procedure focused offices tend to look at individual tooth problems, i.e drill and fill. You have pain from a particular tooth, the dentist treats that particular issue with minimal regard for other issues you may be unaware of. For many people the course of dental diseases is protracted over many years. This fact allows you to get away with a procedure focus for a while. However, this approach will often lead to more work needing to be redone in the future. Problem focused practices (sometimes called Holistic practices) take into account the overall dental and medical conditions as well as potential future dental problems as part of making treatment decisions for the immediate concerns. This approach emphasizes the treatment and control of dental disease and the overall function of the dentition. Such an approach tends to address more than your immediate perceived problems but leads to more predictable restorations and avoidance of large-scale failures. Such practices emphasize a long term Doctor/Patient relationship compared to the episodic relationship of Procedure Focused practices based on emergent dental problems. This approach focus’ on the establishment and maintenance of dental health. That depends on many factors. If your needs are minimal, procedure focused practices are very efficient in treating the few isolated concerns you may have. However in the early stages, most dental disease has minimal symptoms so patients are usually in a bad position to assess their needs. Waiting for symptoms such as pain and swelling means problems have progressed much further than they should have and treatment will be far more complicated. Patients with several different dental problems tend to do better with Problem Focused practitioners. In this setting finding treatment solutions that achieve a harmony in addressing the multiple concerns is best. As we get older the complications from the accumulation of multiple past dental procedures tends to magnify. In adults the need to view cases in the entirety is essential to achieve the highest levels of success. By their very nature, some dental specialties are more procedure oriented. Orthodontists, Oral Surgeons and Endodontists are specialty-trained dentists that are seen only when specific procedures are needed. Once the specific treatment is completed you return full time to your general dentist to continue care. Periodontists, Pedodontists, Prosthodontists tend to have longer-term relationships with their patients due to nature of the problems they deal with. You may still see your general dentist as part of your care as well. Sounds like a stupid question right? Nobody asks that question about hearts and livers. However few of us are really acquainted with this part of our bodies. This is in-part because the dental or stomatognathic system works well with few disruptions for most of our lives. This reliability also leads to the cultural view of what happens when the system goes on the fritz. Dental pain is one of the most debilitating pains a human being can experience. Prior to modern times, tooth pain had been represented in poems stories, art, and sculpture. We do not see the same for hip or knee pain. Teeth are one of the most amazing parts of the human body. They are composed of 3 specific hard tissues, Enamel, dentin and cementum. These occur nowhere else in the body. Dentin and cementum are related to bone but have a higher proportion of hard stuff (calcium and phosphorus) compared to bone. Enamel on the other hand is nearly pure mineral. So much so that for years nobody could figure out how it actually was made. Recently it has been shown that enamel is actually the original Nano-tech material. Once again millennia ago biology figured out how to do something that we humans are just beginning to understand. In order to function, teeth have to be attached to the jawbone. Teeth are not fused to the bone. They sit in a ligamentous joint that acts as a shock absorber. These ligaments insert into a specialized layer of the jawbone called the cribiform plate or bundle bone. This bone only forms in response to tooth development. This structure including the root, ligaments and bone that supports the teeth is referred to as the periodontal ligament or PDL for short. Dentin and enamel, being much harder than bone, do not provide an adequate surface for ligaments from the bone to attach to the root: enter cementum. This third hard tissue is a layer of bone like tissue fused to the dentin of the root that provides attachment for the periodontal ligaments that attach to the bone. Teeth are not fused to the bone. They sit in a ligamentous joint that acts as a shock absorber. These ligaments insert into a specialized layer of the jawbone called the cribiform plate or bundle bone. This bone only forms in response to tooth development. This structure including the root, ligaments and bone that supports the teeth is referred to as the periodontal ligament or PDL for short. Our lives may have been easier if dental pulp tissue did not exist. 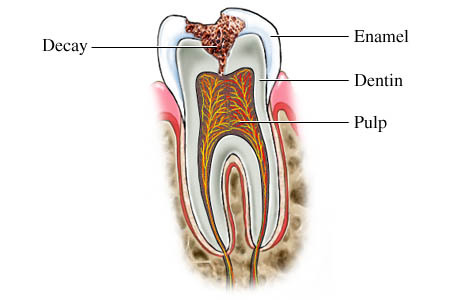 Dental pulp, also called the dental nerve is actually a neurovascular bundle consisting of and arteriole, vein and nerve tissue. This structure is left over from tooth development. This tissue supplies blood to the cells responsible for supplying nutrients and oxygen to the cells that produce the dentin. This process continues at a slow rate throughout our lives. The dental nerve actually serve a purpose in that it helps us sense how hard we are biting. This is one of the reasons why teeth lacking a living nerve are more likely to break. The downside of having this nerve tissue inside teeth is pain. Unfortunately the only type of nerve receptor in the pulp are for pain. Not only are they pain nerves but they are slow reacting fibers. This means that it takes a lot of stimulation to get them to send messages but once they start they keep going which is the aspect that lends the special character to dental pain. The jaw bones and other facial bones as well differ form the rest of the bones in the body. Disease: disease is a particular abnormal condition, a disorder of a structure or function that affects part or all of an organism. It may be caused by factors originally from an external source, such as infectious disease, or it may be caused by internal dysfunctions, such as autoimmune diseases. Diseases usually affect people not only physically, but also emotionally, as contracting and living with a disease can alter one’s perspective on life, and one’s personality. In our every day lives we do not often consider dental disease to be the same as Medical diseases. This is false. In fact dental diseases are the most common diseases that affect people. Dental decay or caries (caries is Latin for “rottenness), also known as cavities, is a breakdown of teeth due to acids produced by bacteria that live on and around the teeth. In a sense, teeth are essentially a form of limestone. If you have ever put an acid like vinegar or lemon juice on limestone the solution will bubble and fize. This action is the result of the acids eating away the calcium/phosphate structure of the rock. The same happens to teeth. Regarding decay, the acids come from the bacteria in the mouth fermenting residual sugars left over in your mouth after you eat. This fermentation produces acids that are held close to the tooth surface. The more sugar you eat and the more frequently you eat or drink the more opportunity the bacteria have to produce acids. They are what you eat…Not all bacteria are equal. The bacterial in your mouth is past on to you by your parents as is most of the bacteria that live on and around you. If you routinely eat a diet that has a high amount of refined carbohydrates the bacterial will shift to include more of the most efficient fermenters, which equals more acids and higher risk for decay. If you limit simple sugars in your diet the bacteria will shift away from this group. This is one reason why two people with equally poor oral hygiene can have very different decay rates. Dietary and stomach acids can play a role in amplifying the effects of bacterial action. 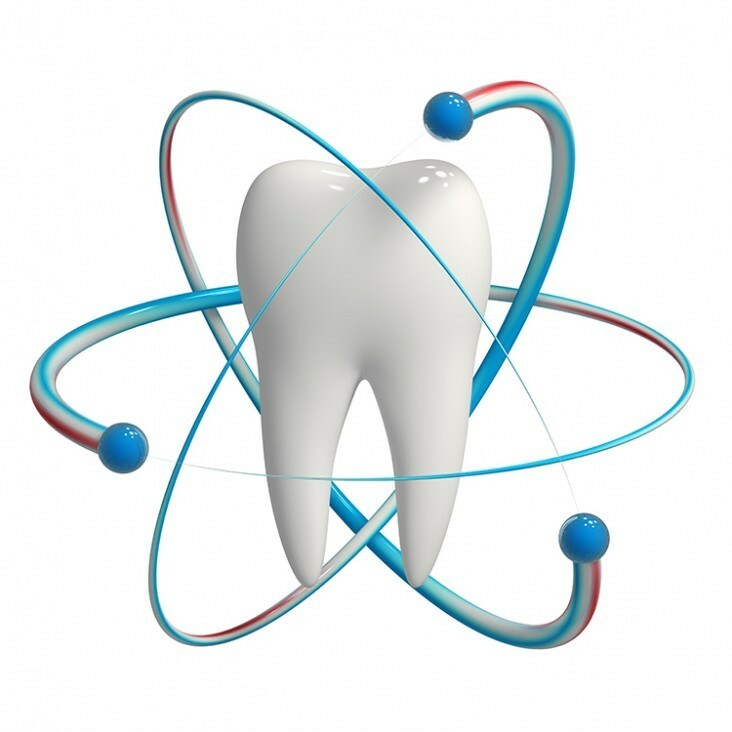 Just as acids produced by bacteria, acids in foods and drink also dissolve and weaken tooth structure. Most often damage from these agents affects the smooth surfaces of teeth. Bacterial activity affects the grooves and other surfaces where bacteria can hide. Teeth are bathed in saliva and have a coating of bacteria on them (biofilm) that continually forms, almost from the moment they are cleaned. The minerals in the hard tissues of the teeth (enamel, dentin and cementum) are constantly undergoing processes of demineralization and remineralisation. Dental caries results when the demineralization rate is faster than the remineralisation and there is net mineral loss. This happens when there is an ecologic shift within the dental biofilm, from a balanced population of micro-organisms to a population that produce acids and can survive in an acid environment. This shift to a cariogenic microbiological population (one which causes caries) is driven by (eaten) sugars. 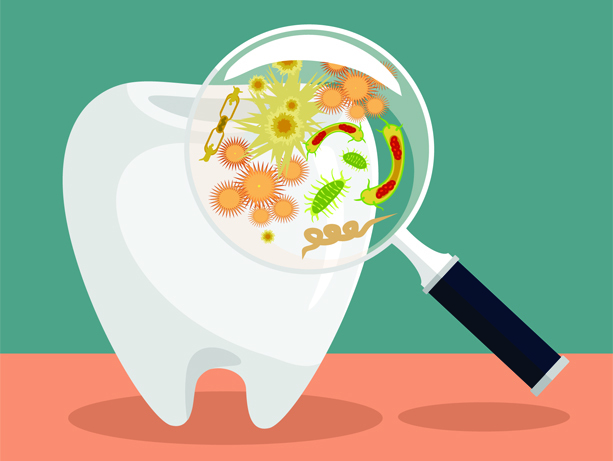 So, bacteria break down the hard tissues of the teeth (enamel, dentin and cementum) by making acid from food debris or sugar on the tooth surface. Simple sugars in food are these bacteria’s primary energy source and thus a diet high in simple sugar is a risk factor. Risk factors include conditions that result in less saliva such as: diabetes mellitus, Sjogren’s syndrome and some medications. Medications that decrease saliva production include antihistamines and antidepressants among others. Caries are also associated with poverty, poor cleaning of the mouth, and receding gums resulting in exposure of the roots of the teeth. Prevention includes: regular cleaning of the teeth, a diet low in sugar and small amounts of fluoride. Brushing the teeth two times per day and flossing between the teeth once a day is recommended by many. Fluoride may be from water, salt or toothpaste among other sources. Treating a mother’s dental caries may decrease the risk in her children by decreasing the numbers of certain bacteria. Screening can result in earlier detection. Depending on the extent of destruction, various treatments can be used to restore the tooth to proper function or the tooth may be removed. There is no known method to grow back large amounts of tooth. The availability of treatment is often poor in the developing world. Paracetamol (acetaminophen) or ibuprofen may be taken for pain. Worldwide, approximately 2.43 billion people (36% of the population) have dental caries in their permanent teeth. The World Health Organizations estimates that nearly all adults have dental caries at some point in time. In baby teeth it affects about 620 million people or 9% of the population. They have become more common in both children and adults in recent years. The disease is most common in the developed world and less common in the developing world due to greater simple sugar consumption. Gum Disease is a common ailment afflicting good oral Health. The most common form of gum disease is gingivitis. 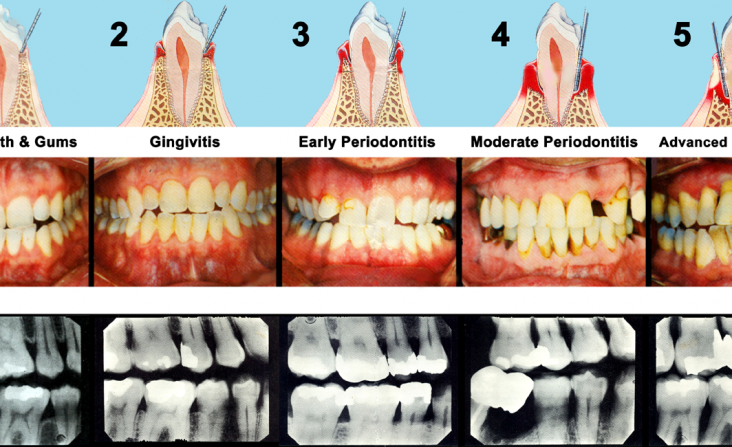 The harmful effects of gingivitis are rarely felt by the person who has them, although if gingivitis remains untreated, it can lead to the much more severe periodontitis. Gingivitis can be caused by a multitude of factors such as diabetes, smoking, stress, inadequate nutrition, and even puberty. While poor oral health is a primary cause of gingivitis, it is not always the only factor. When a person is suffering from gingivitis, his gums will become red and swollen, and may even bleed from contact with foods, or a scrubbing from a toothbrush. After gingivitis is located, a professional cleaning of the teeth and gums followed by the use of an oral rinse in the home will most likely treat gingivitis. Periodontitis is caused when plaque grows below the gum line, and the toxins from the plaque enflame the gum tissue and, eventually if left untreated, the enflamed gum tissue will separate from the teeth. Periodontitis can occur in adults and children, and it can be brought on by untreated gingivitis, or if a person is chronically unhealthy, genetically predisposed to the disease, or suffering from a systemic disease such as heart disease, diabetes, and respiratory disease. Periodontitis has an array of treatments based upon severity that begin with non- surgical treatments and end at plastic surgery. Periodontists are trained to treat the effects of periodontal disease, and have undergone three additional years of specialized training to learn to treat it. To help prevent Periodontal Disease, a person should perform the daily habits of good, quality oral health such as brushing ones teeth and flossing. Also, remember that a good diet helps your body to stay healthy, and areas like your mouth benefit from a good diet as much as anywhere else. Also, if you are a smoker or if you use chewing tobacco, it will give you another reason to add to the long list of reasons why you should quit. Remember, while some people may not be able to prevent Periodontal disease, many people can help to prevent the disease by simply living healthy.